Since the seeds absorb significant amounts of water, the low-calorie, nutritious chia gel gives you a feeling of being full, and has been used successfully for weight loss. 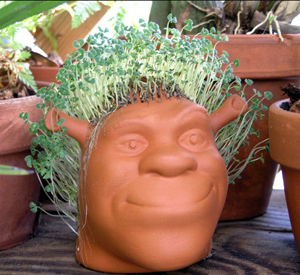 When you hear the word chia, chances are you think of the Chia Pet™ — the little clay character with the sprouted chia seeds covering its body. We laugh at the novelty, but there is nothing comical about the nutritional benefits and medicinal properties of this tiny seed. In fact, it is one of nature’s most nutritious foods. For centuries the chia seed was used as a food staple by the Indians of the Southwest and Mexico. Known as the “running food,” its use for high-energy endurance has been recorded as far back as the ancient Aztecs. The tiny black or white edible seeds are full of protein, minerals and enzymes, and are easily digested. The highly absorbent hull is also an excellent source of fiber and can absorb more than seven times its weight in water, producing a gelatin-like substance that promotes hydration during digestion and acts as a barrier to slow the release of carbohydrates, thus enabling a slower conversion into glucose (blood sugar). Chia seeds can be ground into a powder or roasted and added to soups, stews and salads, or they mix easily into sauces (barbecue, tartar and marinades), sandwich dressings, jams, jellies, ice cream drinks, smoothies, yogurts and nut butters. Chia seeds can be kept for long periods of time if stored in a cool, dry area. If you have been using flaxseeds, consider switching to chia seeds for their superior nutrition and ease of use. Chia seeds have the highest percentage of combined omega-3 and -6 fatty acids of any plant. Plus, they offer 38 percent more fiber and 247 percent more calcium, with fewer calories and less sodium than flaxseeds. Chia seeds also are a great natural source of antioxidants, phosphorus, manganese, potassium, iron, zinc and copper; in addition, they are low in sodium and are gluten- and cholesterol-free. Blend 30-45 seconds or to desired smoothness. Blend 45-60 seconds or to desired smoothness. The consistency will be almost like soft-serve ice cream.